Note: Do not operate the door until you have inspected the track mounts and bracing. Doors have been known to fall on people and cars when they were operated with tracks that were not securely attached and supported. Important note: You should always make sure to disable the manual lock on the garage door before activating the switch. automatic reverse system. As of 1991, garage doors are required to be equipped with a mechanism that automatically reverses the door if it comes in contact with an object. It is important that the door reverses direction and opens completely, rather than merely halting. 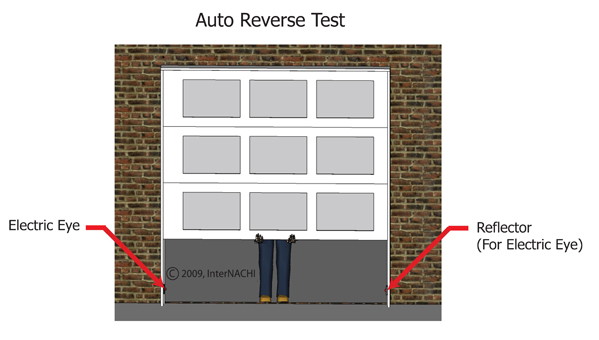 If a garage door fails this test, get it repaired. A dial on the garage door opener controls the amount of pressure required to trigger the door to reverse. This dial can be adjusted by a qualified garage door technician if necessary. Inspecting the garage door and installed openers is just one of the many things we inspect during a Veteran Home Inspection. To schedule your inspection, call 210-202-1974 or book online at www.vhillc.com.